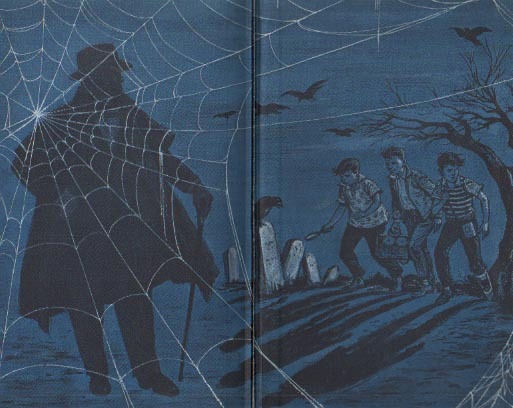 The Blue Graveyard/Spiderweb Endpapers were used in all Hardbound Trade Editions and GLB books from 1964 up until approximately 1975. Plain white papers were put into use in 1975. These endpapers were created by Harry Kane and are one of the most striking and visually interesting endpapers found in any juvenile series books. There has been some speculation about who the ominous shadowy figure in the coat might be. The facial features are unclear but I've always believed that the figure represents Alfred Hitchcock. 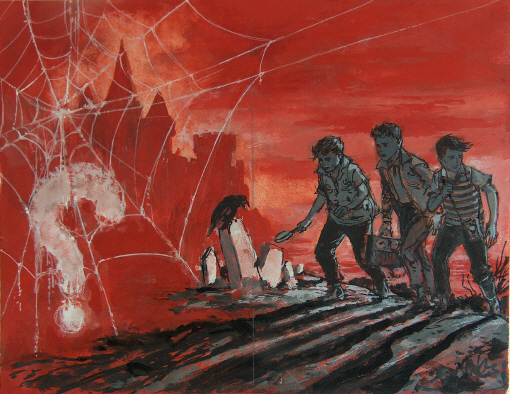 Roughly painted on standard art board, the image measures 8 1/2" x 11" and bears the words "Alternate (erased) Endpapers for Hitchcock Mystery Series" in Kane's handwriting. Evidently Kane was simply putting ideas to paper and using important elements found in the first two books: the castle, the cemetery and the question mark. Weaving the "?" into the spiderweb is a neat idea but it's not very plausible and even the youngest readers would find it incredible. Kane's next attempt at the endpapers is found in this photostat pictured below. The image is almost identical to the finished endpapers found in the books but a close examination of a super-sized image shows many tiny differences which helped Philip Fulmer and myself conclude that this was not Kane's final attempt at the scene. One of the nicest things about this photostat is that the facial features of the man in the overcoat are more apparent. It's reasonably certain that the figure is supposed to be Alfred Hitchcock, although it looks more like Hitchcock from the 1940's than from the 1960's. 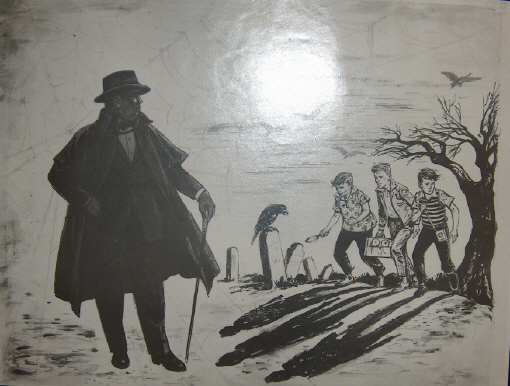 While Hitchcock's image made it onto the covers of the first three books in the series, some notes made by the editor, Walter Retan, on other pieces in the collection reveal that it was a hassle to obtain Hitchcock's approval for each illustration featuring his likeness. Perhaps the image in the endpapers is meant simply to give the impression that it's Hitchcock. It works. Finally, there was no blue painting of the endpapers scene in the New York collection of Kane illustration art. Whether the original survives is unknown but there were several uncut printer's proofs of these endpapers in the collection.